An electronically controlled proportioning valve (ECV) will take an electrical input signal (usually 4 to 20 mA) and proportion the amount of flow through a pipe from fully closed to fully open. These valves are used in industrial automation controls as proportional actuators and other industrial control applications. The OmegaTM ECV valve features programmable reverse or direct acting control. Direct acting means that, as the current signal rises, the valve allows more flow, while reverse acting will decrease the flow rate with an increasing current signal. These units can also be programmed to sense a failure in the current loop and fully close/ open the valve upon the signal level’s dropping below 4.0 mA. Dry contact remote switches can be used in conjunction with the standard current signal to provide an alarm signal which fully closes/opens the valve. 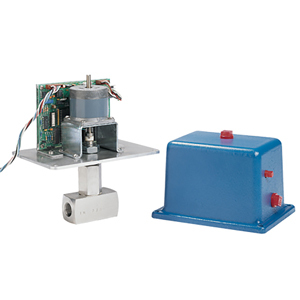 The rugged epoxy-coated aluminum package insures NEMA-4X protection or the powerful microprocessor and servo actuator.